Growth Habit: Cotoneasters have oval leaves that vary from grey-green to dark green depending on the species. There are a large number of commercially available varieties that vary in their height and habit. Type of Plant: Deciduous, semi deciduous or evergreen (depending on species and local conditions) low to tall woody shrubs. Flowers: Inconspicuous small white flowers in bunches in spring. Fruit/Seed: A prolific number of bright red or orange berries are produced in late summer to autumn. Dispersal: Fruit are eaten by birds and animals. The seeds pass through these animals unharmed and may be dropped at some distance from the parent plant in neighbouring bushland. Some varieties sucker when damaged. 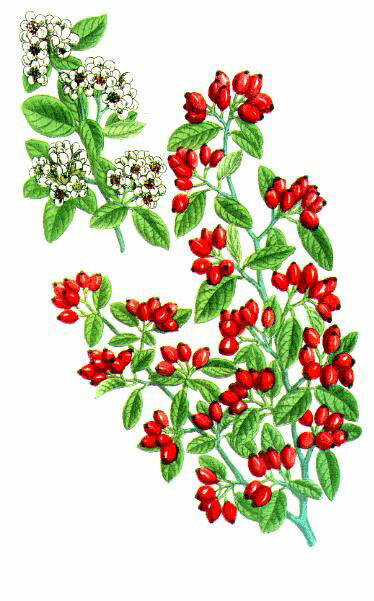 Distribution: There is little collected information about the distribution of Cotoneaster in Tasmania. Many species are very popular as ornamental plants so they are common in all urban areas. Localized infestations can be seen at the edges of native forest, in bush reserves and along roadsides where they have escaped from local gardens. Status: Cotoneaster is not a declared weed in Tasmania. An Environmental Weeds Workshop (1992) organized by the Dept. of Primary Industries and Fisheries, Landcare Tasmania and the Private Forestry Division of the Forestry Commission concluded that Cotoneaster has the potential to become a serious invader of bushland areas. The need for initiating control measures was rated as high to critical depending on its location. The berries appear to encourage and support some introduced pest species of birds including starlings, blackbirds and sparrows. 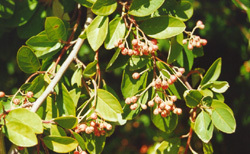 Cotoneaster are commonly used to supply winter colour in many public and private gardens. The bright berries are retained on the bushes for many months. The plants are very hardy. There is much discussion as to whether all species in the group share the same weed potential. For further information on Cotoneaster contact the Department of Primary Industry and Fisheries, Tasmania (Tel: 03 6421 7634, Fax: 03 6424 5142). Herbicide (summer, spring and autumn). Glyphosate or triclopyr + picloram can be used on larger plants applying the cut stump method.